This lease is designed for a short term lease to give the tenant possession of office space while a long term new lease for the same space is negotiated between the landlord and the tenant. Exhibits included: Building Rules and Regulations, Work Letter, Schedule of Removable Property. 1. Definitions and Basic Provisions. (a) "Landlord": COMMERCIAL PROPERTY LANDLORD, INC., a ___________ corporation. (c) `Tenant": AGREEABLE TENANT, INC., a Delaware corporation. (e) "Premises": approximately ________ rentable square feet on the ____ and _______ floors of the building known as ____________________________ located at _____________________________________________ (the "Building"), such Premises being shown and outlined on the plan attached hereto as Exhibit A. 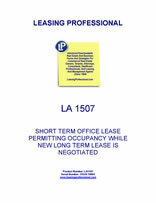 (f) "Lease Term" shall mean the period commencing on __________, and ending on the date (the "Termination Date") which is the later to occur of (1) the date which is 3 days following Substantial Completion (as defined in the New Lease) of the Initial Alterations (as defined in the New Lease) in the Tenant's premises on the _______________ floors as contemplated by the New Lease, and (2) ____________, unless sooner terminated as provided herein. Notwithstanding the foregoing, (i) in the event Landlord and Tenant have not mutually executed and delivered the New Lease by ____________, the Termination Date shall be ____________, and (ii) in the event Landlord and Tenant have mutually executed and delivered the New Lease by __________, but the Initial Alterations have not been completed by ___________, then the Termination Date shall be ____________. (g) "Base Monthly Rent": the sum of $___________ (i.e. $_______ per rentable square foot per annum) due and payable on or before the first day of each calendar month at the office of Landlord during the Lease Term without prior demand, subject to adjustment as hereinafter provided, provided that the Base Monthly Rent for the first full calendar month of the Lease Term and any partial calendar month at the beginning of the Lease Term shall be payable upon the execution of this Lease by Tenant. Base Monthly Rent for any partial month shall be prorated. (h) "Security Deposit": the sum of $0.00. (i) "Permitted Use": general office use and for no other purpose whatsoever. (j) "Utilities Charge": the sum of $0.00, due and payable, as additional rent, on or before the first day of each calendar month, provided that the Utilities Charge for the first full calendar month of the Lease Term and any partial calendar month at the beginning of the Lease Term shall be payable upon the execution of this Lease by Tenant. The Utilities Charge shall increase, as reasonably determined by Landlord, on the first and each succeeding annual anniversary of this Lease. (k) All Base Monthly Rent, additional rent and other charges due hereunder shall be made payable to the order of Landlord or such other party as Landlord may direct. All such payments shall be forwarded to: ___________________, or such other address as Landlord may direct. (l) "New Lease": the proposed lease between Landlord and Tenant for approximately _________ rentable square feet _____________________ on the ________floors of the Building. 2. Granting Clause. Subject to and upon the terms herein set forth, Landlord leases to Tenant and Tenant leases from Landlord the Premises, together with the right, in common with others, to use the common areas of the Building. B. Landlord's failure to furnish, or any interruption or termination of, services due to the application of Laws, the failure of any equipment, the performance of repairs, improvements or alterations, or the occurrence of any event or cause beyond the reasonable control of Landlord (a "Service Failure") shall not render landlord liable to Tenant, constitute a constructive eviction of tenant, give rise to an abatement of Rent, nor relieve Tenant from the obligation to fulfill any covenant or agreement. However, if the Premises, or a material portion of the Premises, is made untenantable for a period in excess of 3 consecutive business days as a result of the Service Failure, then Tenant, as its sole remedy, shall be entitled to receive an abatement of Rent payable hereunder during the period beginning on the 4th consecutive business day of the Service Failure and ending on the day the service has been restored. If the entire Premises has not been rendered untenantable by the Service Failure, the amount of abatement that Tenant is entitled to receive shall be prorated based upon the percentage of the Premises rendered untenantable and not used by Tenant. In no event, however, shall Landlord be liable to Tenant for any loss or damage, including the theft of Tenant's personal property, arising out of or in connection with the failure of any security services, personnel or equipment. (a) Tenant shall pay to Landlord all rents and other sums required to be paid under this Lease without demand, setoff or deduction whatsoever at the times and in the manner provided. The obligation of Tenant to pay Rent is an independent covenant, and no act or circumstance, whether constituting breach of any covenant by Landlord or not, shall release Tenant of this obligation. (b) Tenant shall pay to Landlord, as additional rent, a reasonable charge for all replacements of electric lamp bulbs, fluorescent or otherwise, and ballasts following the initial installation by Landlord. (c) Tenant shall pay to Landlord, as additional rent, all charges for any miscellaneous services, goods, or materials furnished by Landlord at Tenant's request which are not required to be furnished by Landlord under this Lease. (d) If applicable, Tenant shall pay to Landlord, as additional rent, the Utilities Charge described in Section 1 above. (e) Tenant shall pay to Landlord, as additional rent, any rent, sales or use tax or other similar taxes, if any, levied or imposed by any city, state, county or other governmental body as a result of Tenant's occupancy, lease or use of the Premises. (f) In the event that payment of any amount required to be paid by Tenant pursuant to this Lease is not made within 5 days of the date when due, a service fee of 5% of the delinquent amount will be due and payable immediately to Landlord as additional rent, plus interest from the date such payment is due at the lesser of (i) the greatest per annum rate of interest permitted from time to time under applicable law (the "maximum Rate") and (ii) the per annum interest rate publicly announced by __________ Bank, or any successor thereof, from time to time (whether or not charged in each instance) as the prime or base rate in _________ (the "Prime Rate") plus 5%, provided that Tenant shall be entitled to a grace period of 5 days after Tenant's receipt of written notice of such delinquencies from Landlord for the first 2 late payments of Rent in a given calendar year. (g) All payments required from Tenant (except Base Monthly Rent) shall be deemed additional rent hereunder. The Base Monthly Rent and additional rent hereinafter is referred to, collectively, as "Rent". 5. Transfer. Tenant shall not assign, sublease, transfer or encumber this Lease or any interest therein or grant any license, concession or other right of occupancy of the Premises or any portion thereof or otherwise permit the use of the Premises or any portion thereof by any party other than Tenant (any of which events is hereinafter called a "Transfer") without the prior written consent of Landlord, which consent may be withheld in Landlord's sole discretion. Landlord shall have the right to transfer and assign, in whole or in part, all of its interests, rights, and obligations hereunder and in the Building and the real estate associated therewith. Such transfers or assignments, howsoever made, are to be fully respected and recognized by Tenant. Any such transfer shall operate to release Landlord from liability under this Lease from and after the effective date thereof, except as it may relate to the period prior to such effective date. This Lease shall inure to the benefit of the Landlord and its successors and assigns; and with the written consent of Landlord first had, to the benefit of the heirs, executors and/or administrators, successors and assigns of Tenant. Notwithstanding any of the foregoing to the contrary, Tenant may assign its entire interest under this Lease or sublet the Premises to a wholly owned corporation, partnership or other legal entity or affiliate, subsidiary or parent of Tenant or to any successor to Tenant by purchase, merger, consolidation or reorganization (hereinafter, collectively, referred to as "Permitted Transfer") without the consent of Landlord, provided: (i) Tenant is not in default under this Lease; (ii) if such proposed transferee is a successor to Tenant by purchase, merger, consolidation or reorganization, the continuing or surviving entity shall own all or substantially all of the assets of Tenant and shall have a net worth which is at least equal to the greater of Tenant's net worth at the date of this Lease or Tenant's net worth at the date of Transfer; (iii) such proposed transferee operates the business in the Premises for the Permitted Use and no other purpose; and (iv) in no event shall any Permitted Transfer release or relieve Tenant from any of its obligations under this Lease. Tenant shall give Landlord written notice at least thirty (30) days prior to the effective date of such Permitted Transfer. As used herein: (a) "parent" shall mean a company which owns a majority of Tenant's voting equity; (b) "subsidiary" shall mean an entity wholly owned by Tenant or at least fifty-one percent (51%) of whose voting equity is owned by Tenant; and (c) "affiliate" shall mean an entity controlled, controlling or under common control with Tenant. Notwithstanding the foregoing, sale of the shares of equity of any affiliate or subsidiary to which this Lease has been assigned or transferred other than to another parent, subsidiary or affiliate of the original Tenant named hereunder shall be deemed to be an assignment requiring the consent of Landlord hereunder.